We offer a full range of services from identifying potential funding sources to completing final reports. All services begin with us getting to know your organization, projects, and fundraising goals. The better we understand your work, the better we can advocate for your funding needs. Together we will generate a clear picture of the work to be done and a timeline for completion. Fees for services vary depending on the complexity of the project. Please contact us for an estimate. Genie Grants can create a new proposal or LOI that highlights your work and its importance, or we can tailor a preexisting proposal to the needs of particular funders. We can help you develop all parts of the narrative including a needs statement, program design, goals, and budget. A boilerplate proposal or LOI is a template with responses to all of the major categories of information usually requested by foundations. A good boilerplate can be used as a base to write proposals to many potential funders. Genie Grants will find upcoming funding opportunities that are a good match for your needs. We will generate a spreadsheet of potential funding sources for which you qualify. Your customized prospect list will include all available information about the funder such as contact information, areas of interest, range of award amounts, and deadlines. Accurate, timely reporting is essential to a good relationship with your funders. Genie Grants will compile interim and final reports that demonstrate the progress toward your goals and the funder’s goals. Organizations with multiple fundraising needs can contract with Genie Grants on a monthly or long-term basis to complete a variety of projects. For example, a growing organization might need an updated prospects list and several grant proposals and LOIs all within a given timeframe and budget. Choose in advance the amount of hours per month that you require, and we will be at your service. Contracts are for a minimum of one month. Our full range of services includes grants management, editing proposals, support for site visits, strategic fundraising planning and coaching, creating appeals to donors, and more. 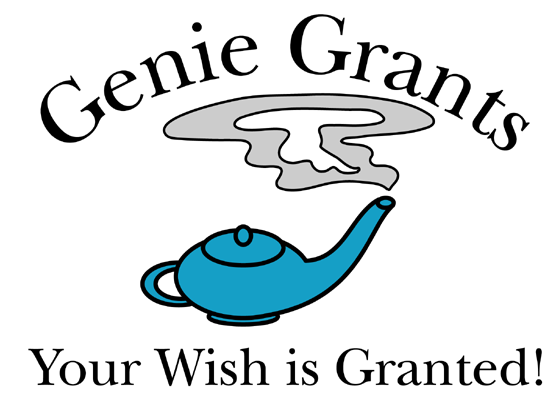 Whatever your needs, Genie Grants can help.